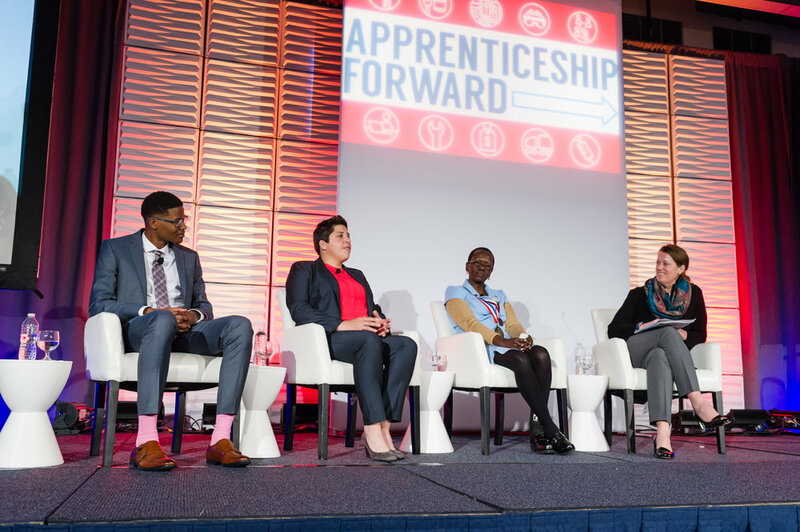 Apprenticeship Forward began as a national conference held in Washington, DC on May 4th-5th, 2017. Bringing together 600 leaders from the apprenticeship community – representing businesses, industry associations and workforce boards, educational institutions, academia, and state and federal agencies – the conference focused on two emerging challenges for American apprenticeship: engaging new industry sectors and expanding apprenticeship access, especially for women, people of color, and young people who have historically been underrepresented in apprenticeship. The apprentices panel at the Apprenticeship Forward national conference, May 4, 2017. In November 2017, conference partners announced the continuation of the Apprenticeship Forward mission through the Apprenticeship Forward Collaborative. Led by National Skills Coalition and New America in partnership with 13 other organizations, the Collaborative will disseminate emerging trends and best practices in apprenticeship from among its partner network. In November 2018, the Collaborative formalized these best practices in its Definitions and Principles for Expanding Apprenticeship in the United States. Also on this page, you'll find information about our partner network, upcoming Collaborative events, and apprenticeship content and resources from the 2017 conference onward. For updates on apprenticeship from the Collaborative's partner organizations, join our mailing list through the link below.